The inaugural Learn by Doing Scholar Award recipients were named at the More than a Motto Conference on May 15, 2015. 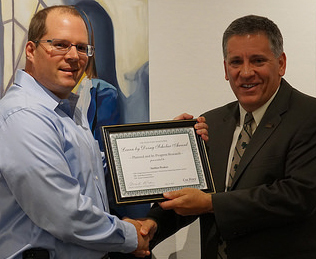 This new faculty award was established in the 2014-2015 academic year to acknowledge and inspire formal scholarship and research into Cal Poly’s signature pedagogy. Dr. J. Kevin Taylor receives the Learn by Doing Scholar Award from President Armstrong. Dr. J. Kevin Taylor, Chair, Department of Kinesiology, was recognized in the category of published research for “Learning Design through the Lens of Service: A Qualitative Study,” published in the Journal for Service Learning in Engineering (v. 9 n. 1, Spring 2014). The committee also acknowledged the team of co-authors: Dr. David Hey, Dr. Brian Self, Dr. Lynne Slivovsky, and Dr. James Widmann. The award includes $2,000. 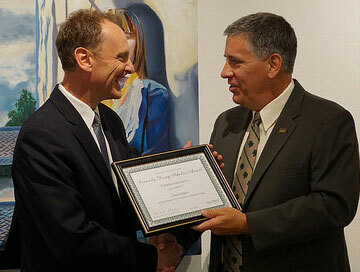 Dr. Steffen Peuker receives the Learn by Doing Scholar Award from President Armstrong. Dr. Steffen Peuker, the James L. Bartlett, Jr. Assistant Professor in Mechanical Engineering, was recognized in the category of planned and in-progress research for a proposal highlighting three pedagogical innovations: team based learning, service learning, and a challenge to students to design their process for becoming a “world class engineering student.” The committee also acknowledged the collaboration of Dr. Jennifer Mott. The award includes $1,000. Faculty were selected by a committee of peers from every college. The award was established and funded by members of Information Services’ external advisory board and administered by the Robert E. Kennedy Library. See additional photos from the reception at the University Art Gallery. Read more on learn by doing scholar award.